Register Now for RTP Estuary Summer Camp! Click here for the 2019 brochure, with complete information about camp sessions. See below for more information and for other mandatory forms. The Roger Tory Peterson Estuary Center Summer Camp runs June 24 – Aug 2, 2019 from 9:00am – 3:30pm. Click here to download the 2019 brochure. • Our Summer Camp staff is First Aid, CPR, & Epi-Pen trained. • Low staff-to-camper ratios ensure all campers have a safe, fun and educational camp experience. • Our Summer Camp staff strive to provide a variety of hands-on activities each day. 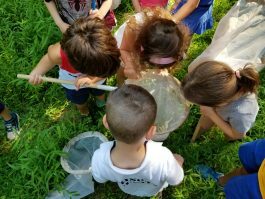 The Connecticut Audubon Society’s summer day camps offer an inviting recipe for both fun and learning at our centers in Fairfield, Milford, Glastonbury, Pomfret and Old Lyme. Campers have many opportunities each week to explore and thrive in the natural environment. Key ingredients on the menu include: interactive hands-on learning experiences, up-close animal/wildlife encounters, chances to develop outdoor savvy, and knowledge and conservation skills to care for our local, precious natural resources at home, school, and at our centers and sanctuaries. You do not have to be a member for your child to attend camp. But to qualify for discounts, you must have a Chickadee ($55 family) or higher-level membership to register at the member price. If you’re not a qualifying member, you may renew or join at the time of registration or online by clicking here or register at the non-member price. Registration for our summer camps begins in February. All information will be posted on our website. Registration is online, or by mail. Please note the following if you do not purchase Registration Protection: All requests must be made by email. Requests for changes must be received at least two weeks prior to the program session for which the change is being requested. For cancellation requests before June 1, 2018, you will receive a refund minus a 20% fee per program cancelled. Membership fees will not be refunded. After June 1, 2018, there are no summer program refunds. If we cancel a program, you will receive a full refund. Articles of Interest: Birding, Wildlife, etc.